Every hardwood flooring install requires a solid finish nailer to tackle key parts of the installation. 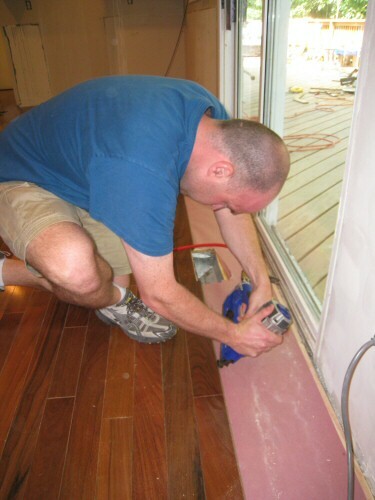 You use a finish nailer to blind nail the first few hardwood boards, blind nail and face nail the last few boards (in locations where a hardwood flooring stapler won’t fit), and attach the baseboard molding to studs on the wall. At the outset of our hardwood flooring installation, DuoFast contacted us and asked us if we’d like to try out their DuoFast Floormaster 250BN 16 Gauge Finish Nailer. The DuoFast Floormaster 250BN is a new tool designed specifically with hardwood installation in mind (although it can successfully double as your full-time 16 gauge finish nailer). We agreed to the review, and also asked if we could try their 200-S Hardwood Flooring Stapler for the same job. The stapler performed superbly throughout the installation and we’re very pleased with the results. Read on for our full review of how the 250BN faired in our tedious trial. We’re in the process of installing 1100 square feet of Brazilian Walnut flooring across an entire floor of our home. If you’d like to keep up with the story, make sure to subscribe via RSS or e-mail (buttons on the right). The highs: Nifty 45 degree angled tip for properly positioning over hardwood tongues; 120PSI max pressure; sinks 16 gauge finish nails through 1.5″ of solid material consistently; thoughtfully includes extra “pads” on the sides and top to prevent it from marring finished work; no jamming over more than 1000 nails. The lows: Doesn’t include the standard male quick release connector – we had to steal one from one of our other finish nailers. Price may be high (retail info. was hard to locate). 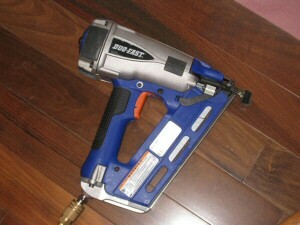 The verdict: A solid sidekick for the tough spots in a hardwood install where the traditional nailer/stapler won’t fit. The claim to fame of the DuoFast 250BN is its eagerness to blind nail the first few and last few boards of the install. It includes a nifty 45 degree angled tip to place the finish nailer in the proper location for hardwood installation (just above the tongue at a 45 degree angle). We’ve installed more than six floors without this simple technology, and blind nailing has always been tedious with nails sometimes thrown into the wrong location. The 250BN completely eliminates this problem. While we used the DuoFast strictly in trigger-fire mode, it includes a bump-fire capability for the more-skilled-than-us installers. DuoFast says the tool also includes a ‘patented depth of drive’ which helps to eliminate tongue splitting. We generally found this to be true; although the 250BN still split a few tongues in the install. (As we noted in our review of the 200-S, this didn’t end up creating difficulties in the installation). We did find that the key to ensuring the nails sink through hardwoods with the 250BN is to apply pressure consistently to the back of the tool at the angle of fire. If you fail to hold the 250BN sufficiently, it sometimes would short drive nails (perhaps a side effect of the depth of drive technology — we’re not sure). We fixed the bulk of these problems with the traditional hammer and nail set, but quickly learned how to avoid the problem altogether. This also could have been exacerbated by the conditions of our flooring install, which had us putting finish nails through at least 1.25 inches of solid material. Duo-Fast lines the exterior of the nailer with small rubber pads designed to reduce or eliminate marring when setting the tool on the flooring surface. You still can’t drop the tool from 3 feet, but this greatly reduced any tendency for marring or scratches during normal use. Towards the end of our installation, we used the 250BN with a supplied regular tip to nail baseboard molding to the studs. The 250BN performed great in this role, sinking every single shot across 400 linear feet of baseboard. While you don’t have to switch away from the 45 degree tip for this effort, we decided to give it a try, primarily to see how hard it was to change tips… (the answer: it isn’t hard at all). We had a great experience with the DuoFast 250BN and in fact just lent it out to a friend who’s planning to use it to reinstall some old molding. We’re sure it’ll get the job done for him and recommend this nailer to hardwood installers as well as to DIYers who don’t already own a finish nailer and are planning to install hardwoods. The product is new so retail pricing was difficult to find. We found one site advertising $277.20, which strikes us as high for a 16 gauge finish nailer. We’d like to see the price around $200, and a max of $235 to be competitive with alternatives, even with DuoFast’s strong leg up with the patent pending technology in this model.